When I enrolled in the truck driver training course at an area technical college I knew I'd spend many hours with my nose buried in books before getting a chance to grind gears in a big rig. At the original orientation meeting, each in-coming student had to buy several books and manuals required for class. I left the campus book store that evening with my backpack 11 pounds heavier and my wallet $200 lighter - but I felt satisfied knowing the journey to earn my CDL was underway. The first two days of training found me in a computer lab, with my pencil and notebook at the ready. 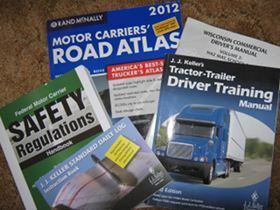 Before me, lay my pristine editions of Rand McNally's Motor Carriers' Road Atlas, the J.J. Keller Tractor-Trailer Driver Training Manual, and the Federal Motor Carrier Safety Regulations Handbook. Eagerly, I waited for the instructor, a grizzled and well-seasoned former trucker, to begin enlightening us with all of his worldly insights into the physical dynamics and operational theory behind navigating an 80,000 pound diesel-breathing behemoth cross country. Instead, we were asked to open our book to chapter one and begin studying sections on interstate/intrastate commerce, cargo documentation, and personal health guidelines. Eventually, I would read, re-read and search through a six inch, 1,200 page mountain of maneuvers and mandates that would eventually allow me to open the door of my first truck. Over the following few weeks I completed the at-home, self-paced program consisting of 38 chapters covering information pertaining to topics such as; control systems, vehicle inspection, backing, coupling/uncoupling, speed/space management, maintenance, and hours of service rules. Laborious as it was, I completed the nearly 950 on-line test questions with an A minus grade. With the bookwork behind me, my class moved from the administration building onto the transportation campus. Because it was mid-January in northern Wisconsin, we were forewarned to bring plenty of warm work clothes – as we'd report to the parking lot at 7:00 a.m. for the remainder of the semester. The first morning of hands-on training it was 22 degrees below zero. And at that time of year the sun doesn't rise until 8 o'clock, so we climbed around the trucks doing our pre-trip inspections using flashlights. Thankfully, the instructors had become soft over the years and couldn't bear the bitter weather. They pulled a truck into the shop so we could work indoors. The following day's temperature warmed to minus five degrees so we worked outside doing safety inspections and coupling trailers for 10 hours. Working in such brutal conditions taught us how important it is to pay attention to detail when your mind is on other things. Cold weather not only makes people slow-moving and stiff – it makes grease-covered equipment stiff, too. One guy, trying to get the school's fancy show truck to move mistakenly popped the clutch with the tractor parking brakes on and exploded both yokes of the driveshaft – dropping it to the ground in a pile of twisted debris. An hour later another guy's fifth wheel locking jaw didn't completely disengage from the king pin when uncoupling a trailer. Again, another pile of broken parts. The school didn't make any money on their new students that weekend, but they taught us a valuable lesson.